Independent Development Fund (IDF) is a non partisan and not-for-profit grant making organization supporting Civil Society Organizations (CSOs) in Uganda. It is set up to deliver support services to Ugandan CSOs to strengthen their capacities to effectively contribute to the country's human rights, civil rights, good governance and poverty reduction efforts. This is done through the provision of grants and grants management support to the CSOs that work to promote a Rights Based Approach, support and facilitates citizens to access and understand laws and Government policies that impact on their human and civil rights. To enable indigenous CSOs access grants through an efficient grant making system. 3. New frontiers in grant making opened and promoted for the protection and observance of human rights at the sub national level. Through a conducive training and career development environment, IDF is seeking to place two (2) young professionals interested in advancing their career in effective programme management and development work. The purpose of placing interns at the IDF is to offer an opportunity for young professionals to receive in- the job training as well as gain practical work experience while offering programmatic support that will enhance the achievement of IDF Programme objectives. IDF seeks serious and dynamic young professionals with graduate qualifications in either of the following areas; Monitoring and Evaluation, social sciences and law. During the placement period, the young professionals shall be expected to provide hands -on support, while demonstrating learning from all tasks assigned. f. With guidance from Programme Officer, review grantee procurement requests and documents. The applicants should be enthusiastic and self-directed, possess excellent time management and administrative skills, and capably manage independently the assigned tasks. The ability to think critically, write clearly, and communicate fluently is essential. The interns will report to the Finance and administration Manager, who will designate the department and staff to supervise the day- day assignments and evaluation of tasks. No remuneration shall be paid to IDF interns. Interns will be facilitated in accordance with the terms stipulated in the IDF Human Resource Policy and subject to availability of funding. The Internship placement will last for a period six (6) months and the duty station will be at the IDF offices in Kampala. · Field of academic specialization or area in which practical training is required. · Programme of training approved by the candidate’s institution, where applicable duration of the internship. · Number of credits required for validation by the candidate’s institution, where applicable. · A supporting letter from his/her learning institution, where relevant. Deadline for receiving applications is 2nd February, 2015 and only successful candidates will be contacted. Following the sixth call for proposals sent out in May 2014, twenty (20) new grantees were selected and awarded to operate in 17 districts of Uganda. Out of these, 35% are from the Northern Region, 15% from the Eastern region, 40% from the Western region and 10% from the central Region. The total award for the sixth phase is UGX. 4,368,000,000 with 16 projects under Human rights and 4 under the good governance component. Our last 2 calls represent an improvement in distribution. Since December 2014 a series of activities like capacity building, aligning grantee results and budgets, signing off contracts have been going on and soon an induction training. IDF believes that the new grantees will contribute to increased accountability in local governance by increasing citizen’s capacities to demand for accountability, monitor service delivery and facilitate citizenry access to information. This will enable people to get access to justice through supporting human rights activists and legal aid, leading to improved quality of people’s lives through raising awareness of the key policies, i.e. land, health and Universal Primary Education (UPE). The Independent Development Fund is a Ugandan non- political, non- governmental, not for profit grant mechanism, providing support to civil society organizations to promote human rights, access to justice and social accountability in Uganda. We seek to recruit a qualified individual to fill the position of Finance Officer. To carry out the routine accounting function, prepare and produce periodic financial reports including financial analysis for the organisation. Maintain the fixed assets register. Assists FAM in preparing quarterly and annual reports. Contribute actively in the development of mechanisms which ensure that operations of IDF are implemented in a cost effective manner. At least three year’s (3) hands-on all round experience working in an accounting environment, preferably in an NGO operating nationwide. Experience in financial monitoring of grantees would be an advantage. Exposure to one or more computerised accounting packages or experience in using Sage/Pastel would be an added advantage. Please send your application to application@ppg.co.ug. E-mails must not exceed 2 MB. The Closing date is 5pm on the 23rd of January 2015. While we thank all applicants for your interest, only those selected for interviews will be contacted. 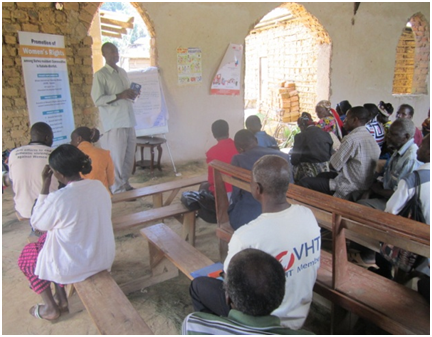 In the bid to address the historical challenge of limited participation in decision making processes and representation in leadership positions (which is believed to be propelling discrimination against the batwa), AICM in the quarter ending December organized sub county level dialogue meetings with the local leaders to discuss this challenge and also devise strategies for addressing it. The meetings held in Ikumba and Bufundi sub-counties pointed out high Batwa inferiority complex as a hiccup to their participation in community leadership. In order to have the Batwa articulate their Human rights issues and get more involved in the fight against discrimination, the local leaders present suggested that more opportunities to improve representation and participation of Batwa at different community levels of governance be explored. They cited election/appointment of the batwa in leadership positions as one sure way of ensuring increased representation and participation of the batwa in governance processes. Several leaders in attendance committed to include the batwa on the relevant committees at the sub counties and within the community; for example Ikumba Sub County Chief and Ihunga Church of Uganda Parish Priest Rev. John Karinyangye pledged to appoint Batwa representatives on the sub-county land committee, Forest Protection Committees and Church Warden positions respectively, while the Head teachers of Ryamihanda and Kiriba Primary schools Mr. Kyarisiima Fabisi and Mr. Ekyorisima Eudita committed to encourage and groom more Batwa pupils to take up responsibility in the respective schools. In fulfilment of the commitments made, some batwa were elected/ appointed to fill various available positions; for example, Sabiti Wilber, Jeriminah Halerimana Pusi, Apollo Kachurwa and Ruzabarande Matekye were selected for training as VHTs, Habyarimana Elias was also appointed as a church warden while Kimpaye Keren was appointed as a mutwa representative on the Murubindi Local Council committee.Similary, Mr. Ngabirano Amulet was also selected to be a community crime preventer, while Kebirungi Sarah a pupil of Kariba Primary School was supported for elections as a head prefect of the school.